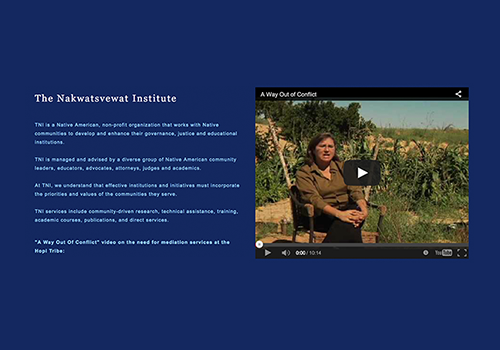 "A Way Out of Conflict" is a short documentary film that provides an overview of how traditional dispute resolution approaches and strategies operate in Hopi communities today. It examines how the Hopi villages retain and exercise authority over the adjudication of certain types of disputes and offenses, and how they do so in a way that works to restore harmony to all parties involved. Association for Conflict Resolution Magazine: "Mediation on the Hopi Indian Reservation"
Navajo-Hopi Observer: "Nakwatsvewat Institute graduates first class of certified Hopi mediators"